April 6th, 2011 – They want to do this because? Did they run out of stuff to work on? And they want to do this because …. ? Does someone want this, or did they just run out of stuff to work on? Some of the stuff they want to do seems to be putting us in charge of the accident, not the Japanese. 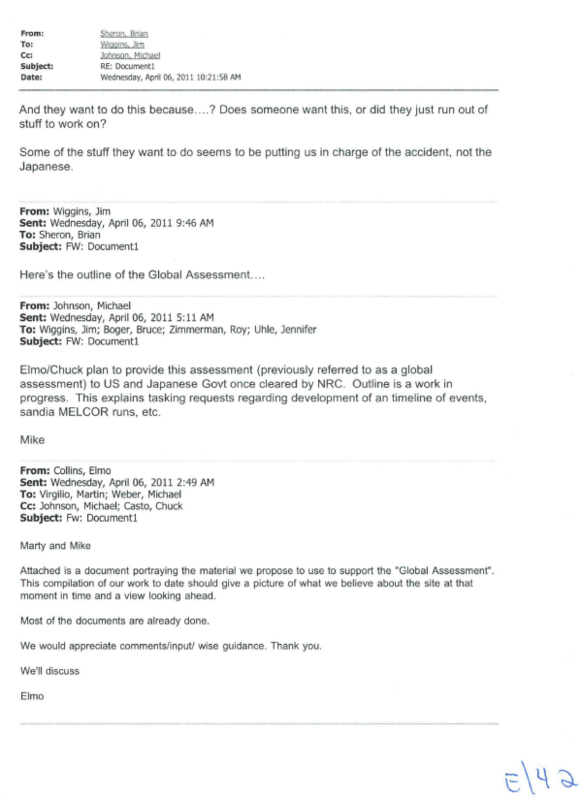 Here’s the outline of the Global Assessment…. Elmo/Chuck plan to provide this assessment (previously referred to as a global assessment) to US and Japanese Govt once cleared by NRC. Outline is a work in progress. This explains tasking requests regarding development of an timeline of events, sandia MELCOR runs, etc. Attached is a document portraying the material we propose to use to support the “Global Assessment”. This compilation of our work to date should give a picture of what we believe about the site at that moment in time and a view looking ahead. Most of the documents are already done. We would appreciate comments/input/ wise guidance. Thank you.